Sticky, hard, and gooey: these candies fill your dopamine receptors with spasms of sugar-filled joy, but if you’re undergoing orthodontic treatment at Liberty Orthodontic Centre to straighten your teeth, then these sweets are not so sweet. While you may have a Willy-Wonka-sized sweet tooth, there are some candies you’re going to have to avoid while wearing braces. Here are five bracket- and wire-destroying culprits that Dr. Rajasekaran and our team recommend leaving on the candy aisle and not put in your mouth, no matter how tempting they may be. All chewy, gooey candies need to be avoided. 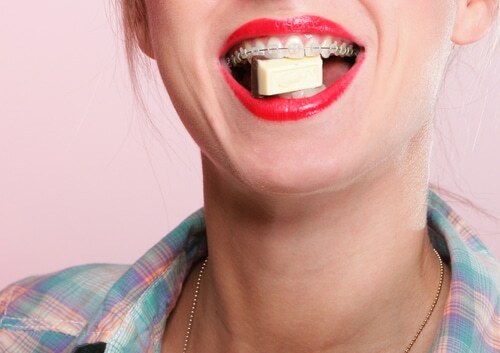 When you’re wearing braces, don’t even think about putting a caramel candy in your mouth. Caramel will not only stick to your braces, making it look as if you haven’t brushed your teeth in a week, but the gooey texture can pull apart the wires, and trigger an emergency visit to Liberty Orthodontic Centre. Have any more questions about what you can and can’t eat when you have braces? Please give us a call at our convenient Markham, ON office to learn more, or ask Dr. Rajasekaran during your next adjustment visit!